Paul Pierce currently leads all NBA players in win probability added for the 2015 playoffs. Win probability added, as I've defined it, measures the impact a player's shots, free throw attempts, and turnovers has on his team's chances of victory. 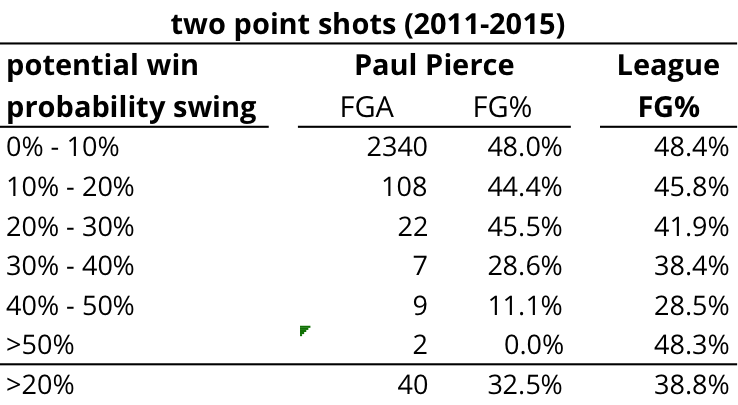 It deliberately gives more weight to "clutch" shots that occur during crucial game situations - situations such as Pierce's go ahead (temporarily so) three point shot last night against the Hawks. That shot, which put the Wizards up 1 with 8 seconds left, increased their win probability by 50%, from 18% to 68%. Had Pierce missed, the Wizards win probability would have dropped to 8%, a total potential swing of 60% riding on Pierce's shot. As I did earlier this week with Derrick Rose, I can measure Pierce's shooting performance during similar high pressure, clutch situations. As it turns out, Paul Pierce is a legitimately clutch three point shooter, at least when measured over the past four seasons. Including last night's clutch corner three, he is shooting 43% on the highest pressure three pointers; those in which at least 50% win probability hangs in the balance. Granted, this is only 7 shots. 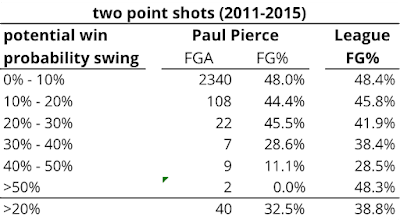 But if we expand our scope to three point attempts with at least 20% win probability at stake, Pierce has taken 67 shots and hit 42% of them, well above the league average of 31%. Two point shots, however, are another story. In game three of the Hawks-Wizards series, Pierce hit a buzzer beating, banked, two point shot near the top of the key. 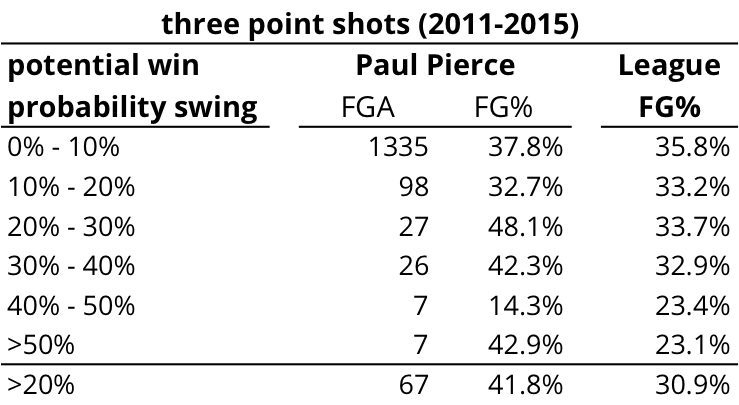 Pierce was all bravado post-game ("I CALLED GAME"), but his recent history with similarly high pressure two point shots has been anything but clutch. 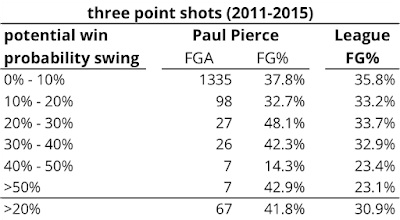 Prior to his game three shot, Pierce had missed ten straight two point shots in which at least 40% win probability was at stake. And of his 40 shots with at least 20% at stake, he has hit just 33% of those, compared to a league average of 39% in similar situations. Does this have any bearing on Pierce's future performance in clutch situations? Most likely not, but I found the difference in clutch performance between two and three point shots to be interesting - one validating the current narrative, and one completely at odds with it (10 straight misses on high pressure two point shots).